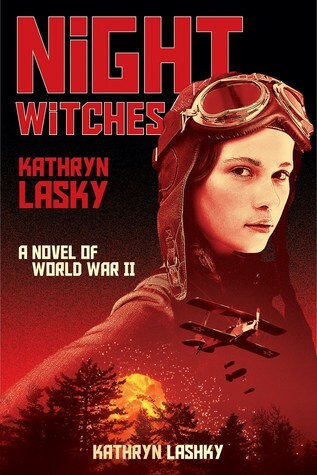 Today, I'm pleased to bring you a special excerpt from Night Witches, a new historical fiction novel from Kathryn Lasky. Keep reading for the excerpt, and a giveaway just for you. And make sure you check out the other tour stops for reviews, interviews, and more! “Noch’ ved’m,” I whisper to myself as I crouch in the rubble of our apartment building and watch the searchlights scraping the night, looking for those tiny planes, the U-2 trainers. Tatyana and I had both learned to fly these light biplanes, their four wings made of wood and canvas. Open cockpit. No parachutes. In these fragile machines the women of the 588th Regiment harass the German Sixth Army. The engines purr so softly that the Germans call them “sewing machines.” But like small, sharp-beaked predatory birds, they will keep up the harassment until the dawn. The Germans set up the searchlights to defend their fuel depots, ammunition dumps, ground troops, and support vehicles—all tactical targets for our Russian army. But that won’t stop the Noch’ ved’m, the Night Witches of the 588th Regiment, who weave through the sweeping beams of light in the loom of the Stalingrad night. The young women who attack Hitler’s forces from the sky. My sister, Tatyana, is one of them. I might have been too, if I had lied about my age. 2 But Mama wouldn’t let me lie. Although I’m only two years younger than Tatyana, my family has always treated me like I’m still a baby. They let Tatyana wear lipstick when she was twelve. But somehow, I was still “too young” at twelve. As for going downtown alone or with a friend, that wasn’t allowed until this summer, and then the Germans came and wrecked everything. Suddenly, there were Nazi soldiers on every street corner. They could stop you for no reason, and they loved to check young, pretty girls for weapons or cigarettes. It was not simply “frisking.” Groping would be a better word. But then the heavy tanks rolled in, and the lewd glances of the soldiers were replaced by sniper fire and heavy bombs. The shelling has been constant ever since. Mama is asleep now, beside me in this corner that we fashioned into a sleeping place. What was our living room is now strewn with bricks. One wall was blown out entirely two days ago. Three remaining walls still stand at right angles to one another. I stare at a calendar on one of the walls. How can a calendar be left? The bookshelves next to the calendar are in smithereens. Once, there were books all over our apartment, but now there are only fragments of pages that blow about like lost sheep scattered from their flock. For nearly two days I have tried to gather up some of these pages. It is a ridiculous task. If they aren’t torn, they are scorched. I cannot imagine what I will do with them. I spy another page, an illustration from The Wonderful Wizard of Oz. Glinda, the Good Witch of the South. She doesn’t have a broom. No U-2 aircraft either. The good witch travels in a luminous peach-colored orb of light wearing a flowing gown. Not like our Night Witches in their flight helmets and goggles, with pistols tucked into their belts. Instead of wands, they have 175 kilos of bombs tucked under each wing. As I bend over to retrieve the page with Glinda the Good Witch, I see my sister’s broken sports trophies nearby. I could never really equal my sister as an athlete, but my parents didn’t want me to feel bad, so they made up a certificate for me that read “Valya, you are the bright red star of our hearts.” In a funny way, that certificate made it worse. I remember Tatyana’s expression when they presented it to me at dinner that night. As Papa was making his little speech, there was a pitying smile on her face that said clear as any words that I would never be her equal, never quite catch up. In the next track meet, however, I did do well—very well. But no one paid one bit of attention to me. Why? Because in the event just before mine, the pole vault, Tatyana had broken the long-standing girls’ record for our school. Hardly anyone was there to witness my accomplishment. They were all over on the field where the pole vaulting took place. My best friend, Irina, was sitting in the bleachers practically all by herself, clapping her hands violently and whooping her lungs out. Tatyana had always outshone me in everything—except for flying. My sister and I had both learned to fly by the time we were twelve years old. Our father was head of the flight training program at Engels airbase, not far from Stalingrad. I’d flown Yak trainers, U-2s, and several others. It was not that unusual, as flying clubs had become very popular between the two wars. We were just very lucky to have a father who was not only a seasoned pilot but a major in the Russian air force renowned for his skillful instruction. Some pilots are great flyers but not especially good teachers. Our father was a great flyer and a great teacher. Intrigued? Want to know more? You can find the whole first chapter here. 3 winners will receive a finished copy of NIGHT WITCHES, US Only.